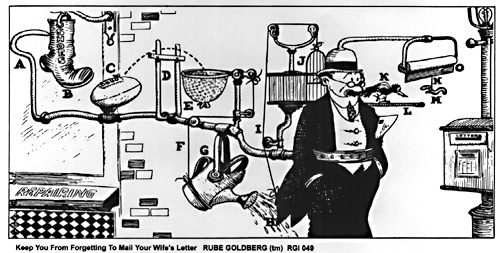 Below is one of our favorite cartoons created by Rube Goldberg. Try to figure out what it does! It starts as you are walking down the street, with your contraption around your waist. As you near the mailbox, the boot from the shoemaker's shop gets caught on your hook. It ends when a sign is pulled down in front of you, with the reminder, "You sap. Mail that letter." Don't leave home without one. Please visit the Official Rube Goldberg site for more original Rube Goldberg artwork (or if problems with that link, try this one). In addition, you can purchase a book called Inventions, containing 30 beautiful, color postcard pages of Rube's masterpieces. Available from your local bookstore, or order from Borders on-line here. ISBN number: 1556705247. Frank Wolfe, founder of Rube Goldberg, Inc. is currently working on a new book to be released in September 2000. Look around this site, learn more about the amazing Rube Goldberg, and see how you can participate in a Rube Goldberg Invention Convention, in Lancaster, PA! Illustrations © of Rube Goldberg Incorporated. Rube Goldberg is a trademark of Rube Goldberg Incorporated. Materials © of Mechanical Invention Workshop and the Rube Goldberg Invention Convention, 1999.